An easy way to get your skis and poles to the slopes! This product is out of stock until November 29, 2019. If you order now, we'll send it to you as soon as we are restocked. Any questions? Email us. Conveniently transport your skis and poles to the slopes! The Ski and Pole Carrier is a quick, easy way to get your gear to the powder. 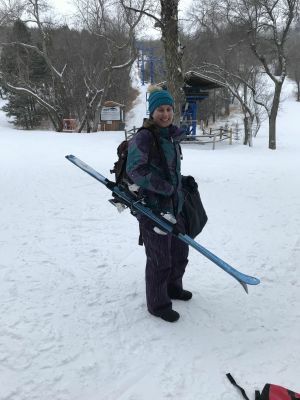 Instead of wresting your skis and poles under one arm, the carrier allows your to simply sling the strap over your shoulder and get on your way. This is the perfect solution for transport from the parking lot to the lodge, from the lodge to the slopes, etc. Adjustable: the easy-to-adjust shoulder strap allows the system to work for your size. The adjustable velcro straps wrap around skis of any size or style. Perfect for on-the-go This system handles your bulky gear yet is small and compact to fit in your jacket or pack while on the slopes! Where are the ski poles -- how do they carry on the sling? 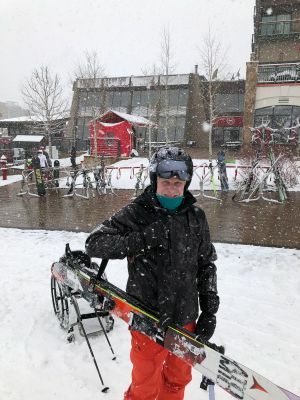 You slip the poles in above the skis with this poles & skis carry system - the strapping system gets looped around the poles and the skis to hold them in place. I originally bought two of these for my kids but liked them so much I ordered one for myself. Have recommended it to several friends who have purchased them. I love this strap! It has been very helpful walking around our ski area. My hands would hurt when I had to carry my skis for a while and this makes me completely hands free. I like to wear it in a cross body way and that allows me carry the weight with my whole body. Great product that is easy to use and works well. It is easy to strap poles and skis in. Showed up quickly in mail and was in good condition. Can be sized for my children to carry their skis. I like the strap as it's made out of good quality material but it doesn't have a quick release. The velcro used to bind the skis and poles has to go through a buckle before it binds up and so to get your skis out you have to feed the velcro back through the buckle. This ski carrier is just what I needed. With two small kids, I am hauling a lot of gear and I don’t always have access to a locker. This strap gets the job done, and pops right into my backpack, it is small enough I could keep it in my pocket if I had to. The ski & pole carrier worked great for transporting my skis and poles to and from the slopes. It does a great job securing the skis and poles and keeps them from flopping around. The only issue I have with the product is it tends to slip off my shoulder. If the strap had an anti-slip surface, I would have rated it excellent. The straps fit around my shape skis. Shoulder harness is comfortable and adjustable. I like the strap, but wish the shoulder pad was longer, had some cushion and didn't slip. Neoprene wet suit material would probably work well. I carried my skis & poles with the carrier last weekend & I'm super happy! I don't have to rent a locker to stuff my bulky ski bag in, anymore!! I just unstrap my gear & throw the strap in my backpack!! Sweet!! The product is great. Works as easy as advertised, great price. First time out I had several people ask me where they could find one.